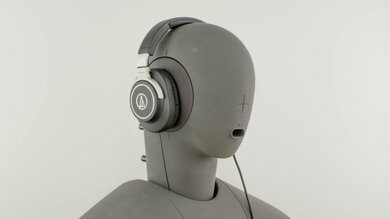 The Audio-Technica ATH-M70x deliver a decent sound but lack the bass and versatility of the ATH-M50x. They're stylish, comfortable and come with a good case but have a slightly weaker build quality than some of the previous ATH-M models. They also don't block noise very well. Good instruments and vocals reproduction. The ATH-M70x make slight stylistic changes to the overall aesthetic of the ATH-M series. They keep the iconic studio look but have a different headband and ear cups design. They're a bit more loose-fitting and comfortable than the previous models but also a bit less stable. 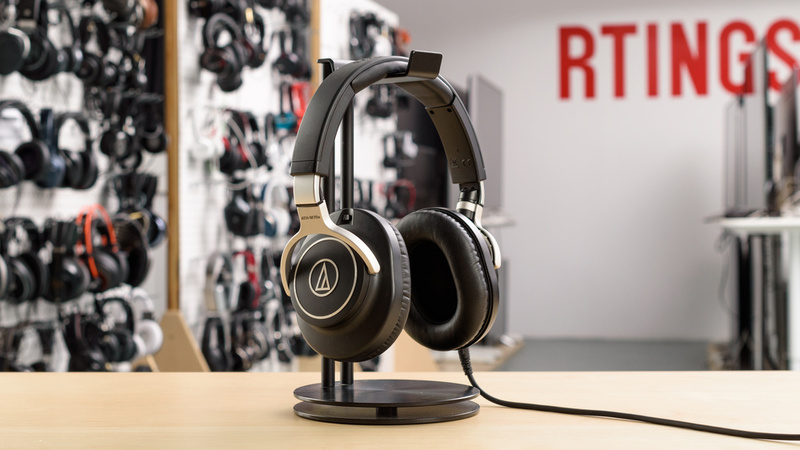 Unfortunately, the headband no longer has a sturdy metal frame, and they don't fold into a more compact format like the ATH-M50x. They come with a good case but are still a bit too cumbersome, to comfortably carry around without a backpack. 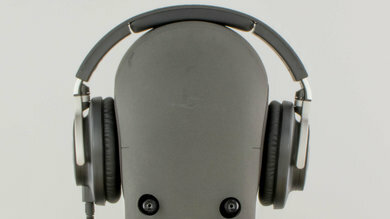 The ATH-M70x look slightly different than the rest of the ATH-M series. They keep the overall aesthetic the same, with a bit more silver accents but change the ear cup and headband design. 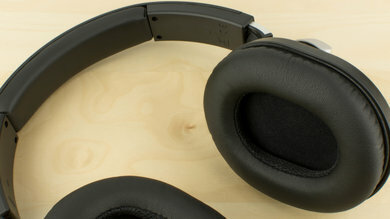 This gives them a more premium appeal but unlike the ATH-M50x they're entirely made out of plastic. So upon closer inspection, they don't look as high-end as they appear to be, which is slightly disappointing considering the previous models are less expensive but seem more durable. The M70x are above-average comfortable headphones. They're not too heavy or tight on the head. They also have slightly better padding on the ear cups than the ATH-M40x and M50x. However, although the ear cups are large, the opening created by the padding feels a bit small and sometimes touches the tip of the ear. 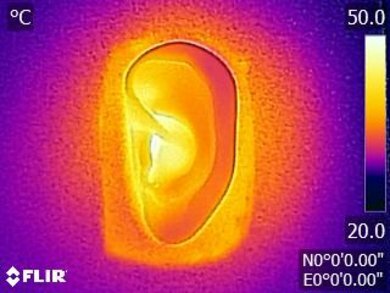 This can cause slight discomfort during long listening sessions, but it's not significant enough to be an issue of concern. 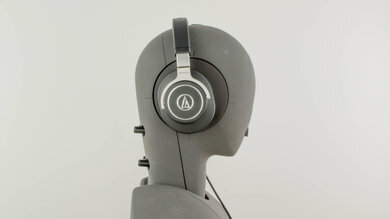 The ATH-M70X are large over-ear headphones which unlike the ATH-M50x, do not fold into a more compact format. 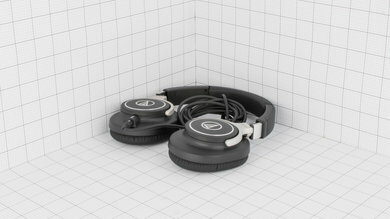 The ear cups lay flat to save space, but they will still be too bulky for smaller bags or handbags. They're too cumbersome, to comfortably carry around on your person, whether they're in their provided carrying case or not. Comes with a sturdy hard case that will protect the headphones from water damage, scratches, and falls. 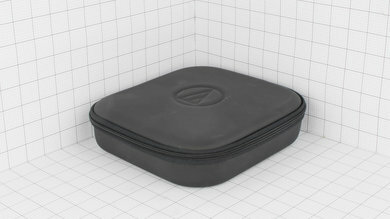 However, the case adds a fair bit of bulk to the already large headphones. The M70x have a different build than the rest of the Audio-Technica M line up. The headband frame is no longer metal but a dense plastic that will still be able to withstand decent amounts of physical stress but will not be as sturdy as the ATH-M50x's headband. 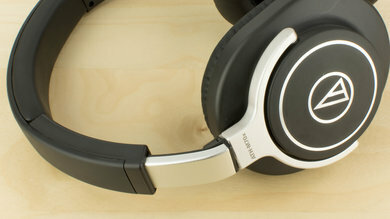 They're durable headphones just not as durable as some of the less expensive models in the same series. Also, the all-plastic build feels a little cheap for their price. These headphones are not meant for sports. They're not tight enough on the head for use while running or exercising. They will stay in place during casual listening sessions but will quickly fall off your head if used during physical activity. 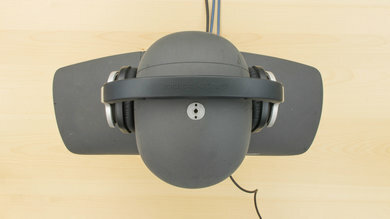 Also, the detachable cable locks into the ear cup. So if the cable gets hooked on something it might pull the headphones of your head before disconnecting. 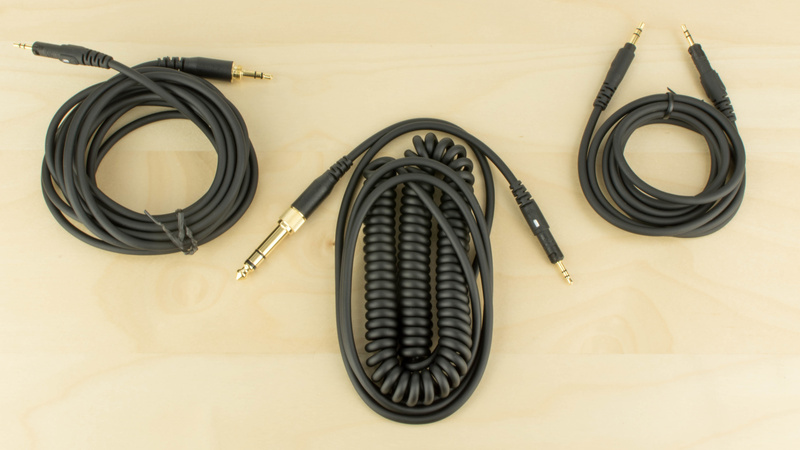 Comes with three audio cables; two 1/8" to 1/8" TRS audio cables with no inline controls and a 1/8" to 1/8" TRS coiled audio cable with no inline controls. 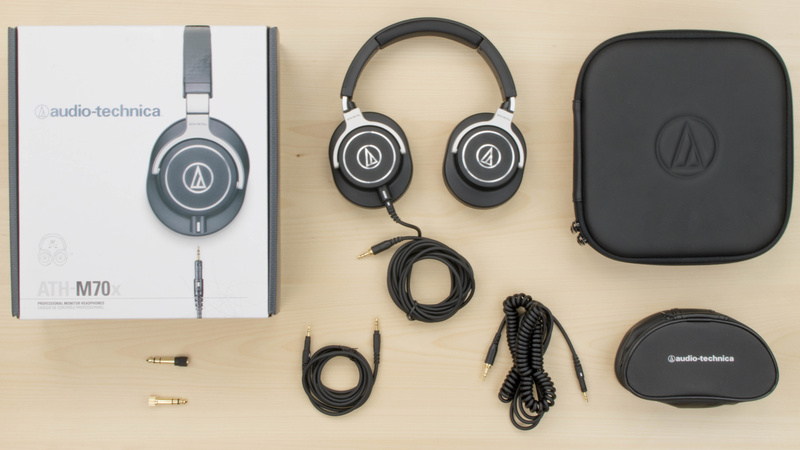 The Audio Technica M70x, is a good sounding pair of closed-back over-ear headphones. They have a very good Bass, a very good Mid Range and a good Treble. However, their Bass lacks a little bit of consistency and sub-bass, and their Treble is on the bright and sharp side. 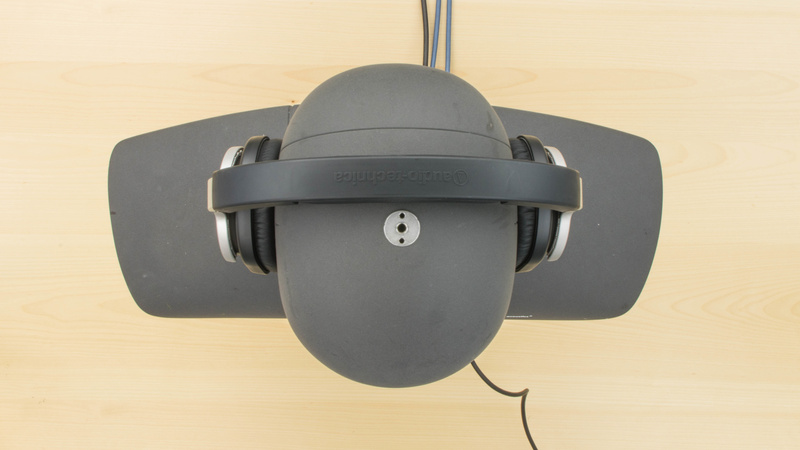 Additionally, like most other closed-back headphones, they don't have an open and spacious Soundstage. The frequency response consistency of the M70x is mediocre. 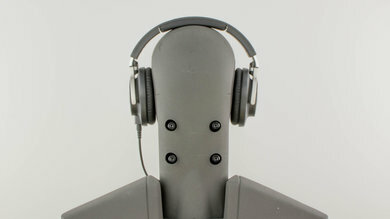 These headphones showed about 6dB of deviation in bass delivery across our 5 human subjects, with the most drop in bass measured on our test subject who wears glasses. This is significant and noticeable, however, their treble delivery is quite consistent. The ATH -M70x are passively isolating headphones. This means they can only block noise by the quality of the seal they create around your ears. Unfortunately, although the seal is decent the level of isolation it provides is not enough for loud environments. They won't fair well on noisy commutes and will be unideal for flying. They also will leak at higher volumes so they may be distracting to the people around you in quieter settings. Poor isolation. 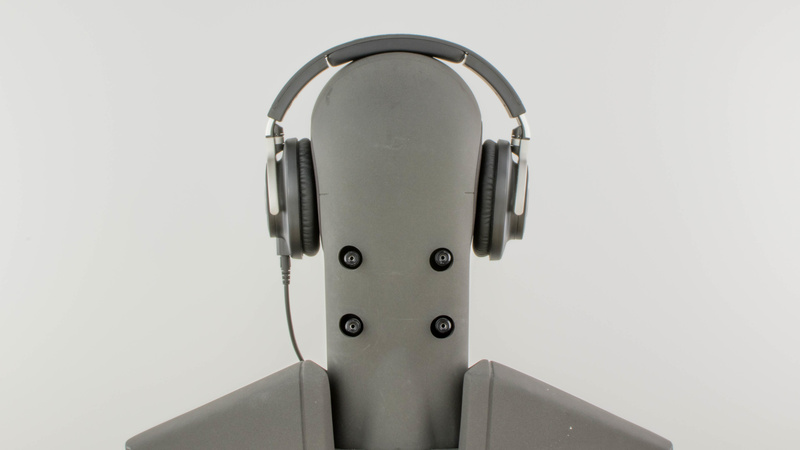 The passive isolation provided by the ear cups performs well in the treble range. They consistently provide more than 20dB of isolation. However, the overall amount of isolation in is only about 10dB the mid-range and 0dB in the bass range. Average leakage. The significant portion of the leakage is between 2KHz and 8KHz, which is not too broad. The overall level of the leakage is also about average. The M70x are geared towards a crisp representation of instruments and vocals but lack a substantial amount of bass for the average listener. That combined with their poor isolation makes them less versatile, than the cheaper ATH-M50x or M40x, for everyday casual use. 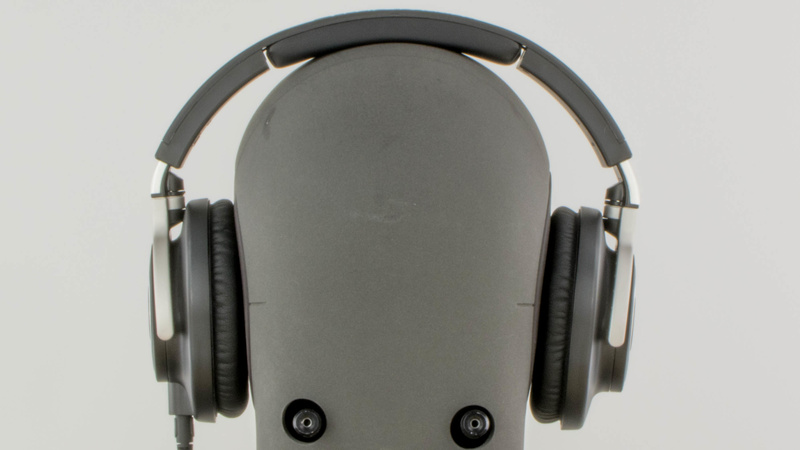 The M70x are decent headphones for critical listening. They're bass-lacking compared to the M50x, which deliver a more balanced listening experience. However, they have a decent soundstage despite being closed back headphones. 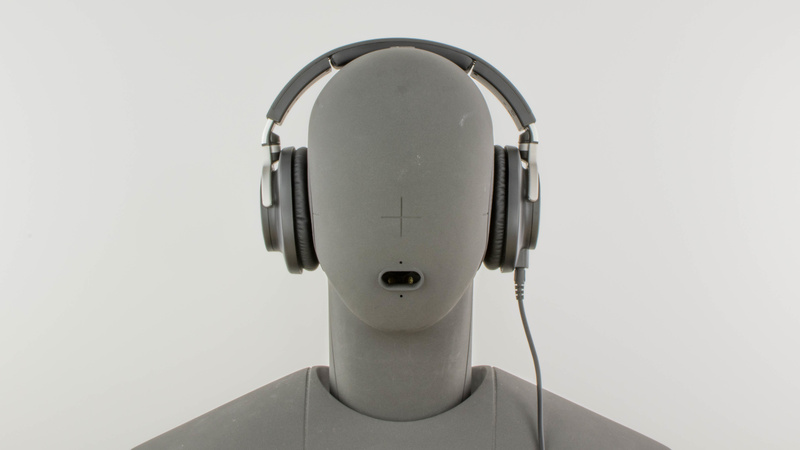 They also have an instrument-heavy audio reproduction that will please some listeners but may be too sharp for most. Mediocre for commuting. The poor passive isolation won't block the ambient noise of a busy commute. They're also a bit cumbersome to carry around on your person. Not made for sports. They're large slightly bulky and not the most stable on the head. They're decently comfortable and not too heavy but will fall if used while running or jogging. Average for office use. They won't block the ambient chatter of a lively office, and also leak a bit at higher volumes. Above-average for home theater. They're comfortable headphones with an above-average sound quality. This makes them suitable for both listening to music and watching movies although they do lack a bit of bass when compared to the M50x. They also have no latency since they're wired but the cable may not have enough range to comfortably watch movies from your couch.